This is a long-awaited and much needed book. As with Phil Bagge's How to Teach Primary Programming using Scratch, it will help primary teachers deliver computing lessons using the Crumble microcontroller. 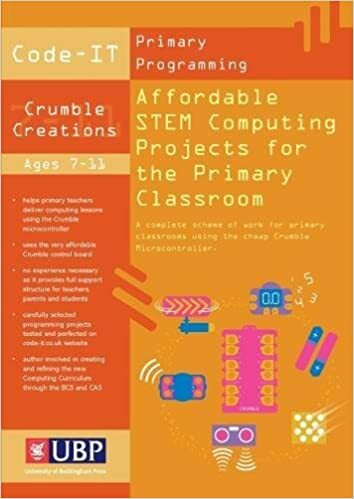 It is invaluable for schools, advising how they can resource, integrate and use the very affordable Crumble control board to provide elements of computing science through programming and design and technology. Yet it is written for people who need have no experience of electronics or programming. This book is for primary teachers who want to introduce an element of physical computing into their curriculum, for home schooling parents of primary age children, for those parents who want to make things with their children and for anyone involved with coding clubs. It simultaneously enriches other curriculum areas, providing imaginative and flexible lesson ideas and instructional techniques. There is huge opportunity for collaborative work and once the basics are understood both teachers and pupils will not only be combining science, design and technology and computing, but also developing cross-curricular art, geography, history and maths projects - and more. The scheme is designed for pupils between the ages of 5 and 11; it may also be useful for older pupils with special educational needs. The new computing curriculum is truly transformational but only with the right support for teachers, as few primary teachers and pupils have any experience of programming and the thinking skills that underpin it.